To demonstrate the concepts of “at rest”, “active”, and “passive” soil states, a small test is constructed inside a box that has clear acrylic sides on the front and back and plywood for the two sides and bottom. The box is filled with ¼” diameter dowels cut to the width of the box. Before the dowels are deposited in the box, a plastic sheet wall is inserted vertically in the center of the box, dividing the box into two halves. 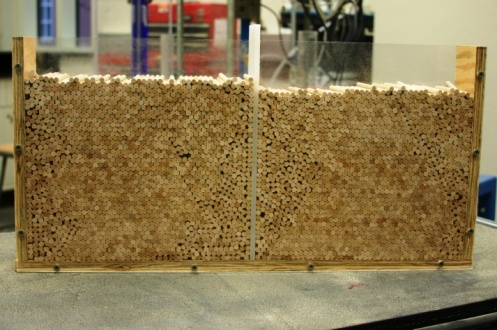 During the demonstration, the sheet wall is rotated to simulate movement of a retaining wall (passively on one side and actively on the other), and the effect of the dowels will be monitored. The class looks at the failure wedge on each side and talk about the effect of the lateral pressure (increase or decrease) for each case.